Unfortunately, not too many people get to see the wonderful stained glass window in our Blessed Sacrament Chapel. 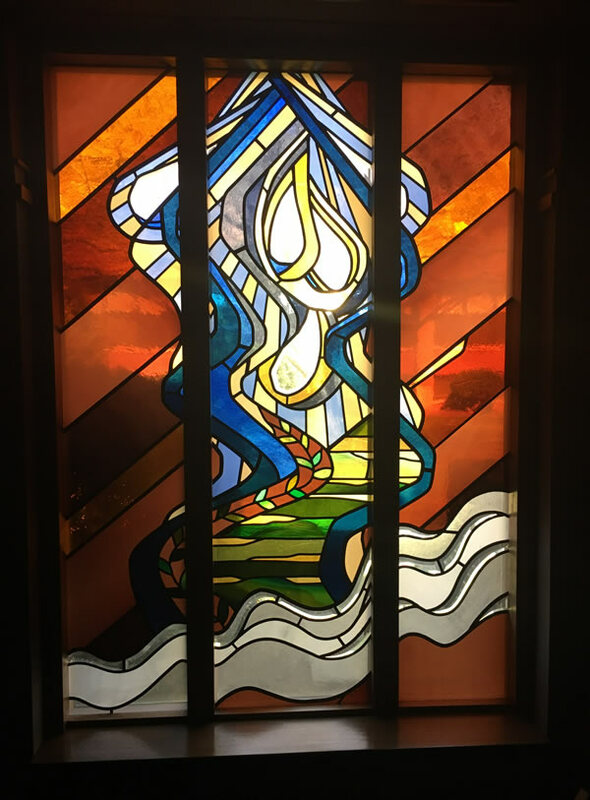 It was done by our neighbor, Anne Moore in the 1990’s when we renovated the whole chapel. The colors play off of the windows in the main chapel, but these panes of glass are larger. I have always loved the movement in this window. Since our neighbor also had a great view of the river below us, she included it in this window. And then even more wonderful is the tear drop panes of bread falling from heaven— none other than manna from heaven– so very appropriate for the Blessed Sacrament Chapel. Many times I have sat near that window hearing confessions during Adoration times. It speaks of the graciousness of a loving God, who not only forgives but feeds us with the finest of all wheats — the Bread of Life. In preparation for Holy Thursday, it is a perfect place to spend some time in silence and mediation.